Extra credit to anyone who knows where this photo was taken. 45 responses to Ever see an Amish buggy like this? Erik, it looks fairly standard to me. It has the typical canvas sides that role up. Thats what I’m used to seeing. No triangle though. I’m guessing Indiana because of the court case they won not to use triangles. The main thing here is the reflectors. do not use triangles. They do use strips of silver reflective tape. Occasionally after dark one can see a dull red lantern attached to the rear corner of the buggy. “Our” Amish are of the old order Swartzentruber group. I haven’t ever seen a buggy exactly like that one. Possibly a Michigan buggy? I don’t believe it’s Indiana. If my memnory serves me correctly, I think Indiana buggies have to have a license plate on them. It’s been a few years since I was at the Amish area in Indiana, but I think that is the state where I saw all the buggies with tags. This buggy is owned by someone in full fellowship with the place I was or one of its daughter communities. So, I will let others guess for a while before I let the cat out of the bag! the rectangle reflectors are certainly different. I’ll say the photo was taken outside a barn on someone’s farm! LOL Sorry, that’s as close as I can get. It’s not in Michigan nor Grayson County. It is not a Holmes County buggy. And definitely not from Lancaster County or Southern Maryland … very strange reflectors!! Maybe a settlement in Cananda? LOL …. I meant CANADA!!! At least you didn’t say Canadia! No, it is in the US. Somewhere in the Midwest, to be more precise. It is an Amish buggy. Funny you say that Eric … my husband always says “Canadia” in a joking way. Hmmmmmm … maybe Texas? I’m just guessing!! It looks like the Old ORder Mennonite in NEw York State. I have friends of mine who are Old ORder Mennonite and have one very similar to this. So I am going to go with New York State-my home state. Is it Minnesota? Looks like a load bearing buggy. Near Ashland – Route 58? It does have kind of an intimidating look. For some reason I thought “Darth Vader”. I am going to guess a Swartzentruber Amish buggy due to the lack of a triangle. And the red barn with a metal roof! Somewhere in Indiana perhaps? Thanks for the great pictures! 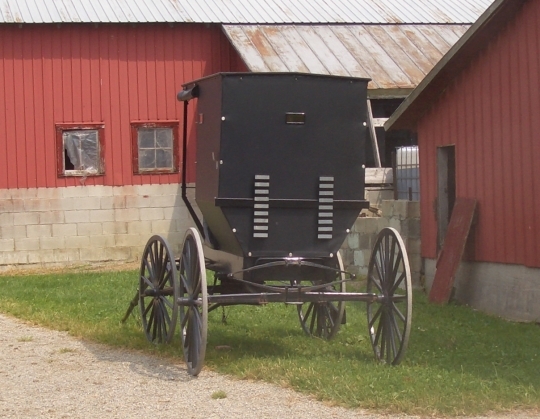 I was going to say the same thing, near Ashland, Ohio, as it looks like a Swartzentruber Amish buggy? Those are interesting reflectors. I would say it’s from a Swartentruber community somewhere, but then again, the reflectors still look to fancy for them. I’ll take a stab…somewhere in Indiana? I’ll bet that buggy is from Missouri ????? I think I would have to guess in Indiana near where the Amish build the RVs??? Just a complete off the wall guess as I have never been there, LOL. Hmmmm… Maybe somewhere in Wayne County, Ohio? Wooster? I am not too far from there! Looks like its from Michigan. Minn. and IA don’t have buggies like that, nor reflectors like that. Interesting guesses keep rolling in, no one’s hit it yet! Is it from Homerville, Ohio? Ever see a buggy like this? Well, from the Midwest and no one has mentioned it yet? I’ll bring my state into it and guess, mind you. Is it Iowa? If so, maybe Hazleton….. I know I am wrong since you say it is in the mid west but I saw one like it near Huevelton in upper New York State yesterday. I would agree that it has to be a Swartzentruber buggy since it shows only the reflectors and no triangle. Based on Stephen Scott’s book “Plain Buggies” (page 36), either Hardin County (OH) or the Swartzentruber’s in general in Ohio. The buggy is from Hardin Co.! This buggy style is also used in Gladwin (north) and Hillsdale Co in Michigan. Notice that the buggy does not have brakes! Yikes! The top of this buggy is masonite, where as Swartzentruber buggies have tops made out the same plastic cloth material as the sides and back. Also, the back of this buggy has a full width roll up flap. On Swartz. buggies, the flap is only as wide as the very bottom of the buggy, the rest is permanent. The reflective strip on Swartz. buggies is divided around the perimeter of the back, not mounted on a board. This buggy has a bracket for hanging a lantern. Some people have said that they cannot see these lanterns even up close. Last time I was visiting my Amish friends, I checked and it is not at all hard to see a buggy with these lanterns at even a mile away, which is as I remembered. At a quarter of mile, they were very visible. I can say that on occasion the lanterns do blow out and the occupants don’t always notice, happened to me several times. There are 2 ‘albums’ of Amish pictures. Ignore the $19.95 money request, you can look for free, but you have to pay to download the pictures. @ Richard: Maybe your pal Monty came from a Gambino Amish farm on the wrong side of the tracks. I would guess the row is because the State requires so many square inches of reflective material on the back, no certain shape required. The white aluminum pieces dont reflect that well, but I guess it satisfies the legal requirements. And Lance, I disagree somewhat about those lanterns. I hated driving in north Holmes in the Swartentruber area after dark. Maybe I was just used to the flashing orange lights that many of the Old Order used, but those little lanterns just didnt stand out. Black buggy on a black road on a black night, and the best thing is SLOW DOWN when driving a car. I know, but would be cheating! Nice job Rick, Hardin County, Ohio it is, and thanks to Lance for filling in the blanks with all the interesting background info (Lance, you know buggies!). Check here tomorrow for a big buggy post with lots of photos and at least one or two more unusual buggies. I wish I could have seen this sooner,because I was born in Kenton Ohio,when I was almost 12 we moved to gladwin michigan and they are the only communities besides Hillsdale Mi that have reflectors like that.I am really wondering who this Ellie is that left comment above.Please contact me,I would like to know who you are. Leave a reply to Ever see an Amish buggy like this?